This humble side dish is packed with varied flavors and textures. Korean sweet potato and radish release their savory-sweet flavor when they are cooked, and the fermented gochujang brings the whole dish home to a spicy-hearty one-pot dish. You can find Korean radish mu in many Asian markets. Substitute with daikon if you have difficulty finding Korean radish. Per Serving: 183 calories; 6g fat; 21.0g carbohydrates; 14g protein; 0mg cholesterol; 455mg sodium. This is probably one of the most flavorful dishes I've ever had. Definitely in the top 5, in terms of international foods. I couldn't find the radishes so we did have to use daikon, but it turned out phenomenal. 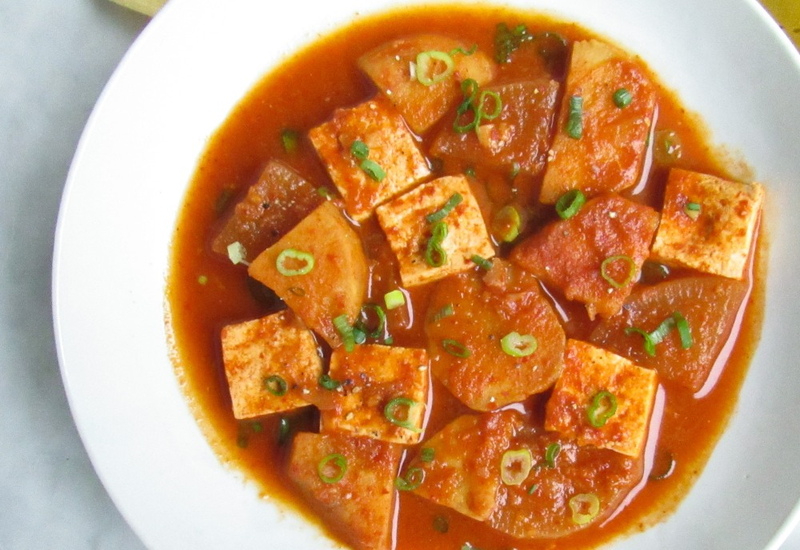 This spicy tofu dish was incredibly flavorful. I'm surprised at how delicious the gochujang is and I'm eager to also try it in other dishes. This is the perfect side for when you're craving Korean food.